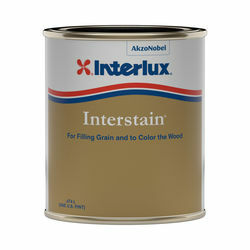 Interlux Interstain is both a wood filler and stain to serve two purposes: it fills the grain of the wood, and stains the wood to enhance its natural beauty. Filling the wood reduces the number of varnish coats required. Available in Brown Mahogany, Red Mahogany, and Chris Craft Red Mahogany. Interstain can also be used to tint Interlux varnishes. Out of the package, this product has a thick paste consistency and should be mixed with Interlux Brushing Liquid 333 to the consistency of thick house paint. Some Important Points If Interstain is not thoroughly dry before overcoating with varnish, the filler will "lift" from the grain and the stain will be apparent on the varnish brush. Product temperature should be minimum 10 deg C/50 deg F and maximum 29 deg C/85 deg F. Ambient temperature should be minimum 10 deg C/50 deg F and maximum 35 deg C/95 deg F. Substrate temperature should be minimum 10 deg C/50 deg F and maximum 29 deg C/85 deg F.
Compatibility/Substrates Apply to clean, dry, properly prepared surfaces only. Do not overcoat directly with unthinned epoxy resin. Touch Dry Time: 50 Deg F: 3 hrs, 73 deg F: 2 hrs, 95 deg F: 1 hr. TRANSPORTATION: Interstain should be kept in securely closed containers during transport and storage. STORAGE: Exposure to air and extremes of temperature should be avoided. For the full shelf life of Interstain to be realised ensure that between use the container is firmly closed and the temperature is between 5 deg C/40 deg F and 35 deg C/95 deg F. Keep out of direct sunlight. Safety DISPOSAL: Do not discard tins or pour paint into water courses, use the facilities provided. It is best to allow paints to harden before disposal. Remainders of Interstain cannot be disposed of through the municipal waste route or dumped without permit. Disposal of remainders must be arranged for in consultation with the authorities. What is the difference between the 573 Cris Craft Red Mahogony and the 579 Red Mahogony? Is one more of a Dark Red? We have 42 brown Mahogany and 1579 red Mahogany which we use to stain veneer panels for woodie automobiles. We found the 1579 red mahogany to be too red for our use and the brown mahogany just right. Am not familiar with the 573 Cris Craft red. The 573 is the proper color for Chris-Craft boats. It used to be called XP573. The name has changed, but the color is the same. My guess is, it depends on the year the boat was produced. And WHO is commentating as the oficial word! My take is the color that pleases you Is the a correct color? And who produces it, could be a tossup. Look at as many boats as you can for color, and you will find that that is the number of OFFICAL COLORS that there is. In any event all the top stain producers make good stuff, find the one YOU like and have at it. Can Interlux Wood Filler Stain be tinted darker, and how? yes I usually put some wood filler in an small plastic container then add some interlux stain and some 333 thinning agent and mix thoroughly. The only way I know you can change the color is to mix another Interlux Wood Filler Stain of a different color. Perhaps mix a little bit of a darker colored stain with the brown. You could experiment with different proportions until you found a suitable color. I mixed the Chris Craft Mahogany stain with this Brown stain because I want to mute the redness of the Mahogany. This worked very well for me. I did indeed purchase Interlux wood filler stain, but ended up using a different product. I suppose you could experiment with some dyes to make the Interlux darker. If you are interested, I can send you some info on wood stain dyes. Feel free to contact me. Yes, I mixed the red and brown mahogany stains to get the color that I was looking for while restoring a 1941 Barrelback Chris. I also used Smith's Penetrating epoxy prior to applying the stain. Dan Danenberg is a great source for this. I have a 57 Chris Craft. Will this fill the cracks between the planks? No, I don't think this is what you want for that. It will help fill tiny variations in the grain and reduce the number of varnish coats before you'll get a level gloss, but it's not really designed for large gaps. My Chris-Craft is a 1949. There are no cracks between the planks on my boat. The planks are five inches wide on the deck. Each plank has three sawn groves about a eighth of an inch wide. When the planks are butted against each other and fastened to the supporting deck beams underneath, they look like planks 1 5/8 inch wide with an eighth inch white stripe or line between each of the planks.I use Pettit boot top white paint and mask the white lines. That is done after the deck is sanded smooth, stained with the Interlux Wood Filler stain, and then several coats of Pettit 2056 Varnish applied, hand sanded with 220 sandpaper between coats.It sounds like you may be wanting to fill the sawn grooves up to the level of the thickness of the plank and not have white lines at all. If that is the case, I would use wood filler, like putty, rather than the filler stain. The stain will easily fill the grain in the mahogany but eighth inch grooves are much larger than the grain. Let the wood filler harden, sand everything well, add the Wood Filler stain, and proceed as described above.I hope that helps. Where can I see your color samples on line? Hello, Jason,Not being affiliated with Jamestown, I cannot answer your question. Since I bought my 1949 Chris-Craft in 1975, the only wood filler stain I have ever used has been Interlux and only the color designation on the can has been, appropriately enough, &quot;Chris-Craft Mahogany&quot;.My suggestion is to search anywhere on line for Chris-Craft classic boats and you will see what that color looks like. How many pints of filler stain would I need for a 17' century resorter? A single pint should be more than enough. One should be great plenty.I did my 18' Glen- L gentleman's cruiser using 2/3 pint. Looking at some Google images, it seems to be a similar size and layout to my 18 foot Chris Craft Riviera. So, one pint would be more than enough. By two or three times. You will have plenty. I used not even an entire pint on both sides of a new Mahogany front door six feet tall. Otherwise, I'm sorry to not be able to comment on your question. I will say however, that I loved this product, as it has a deep rich tone, and was very effective when used as they suggest. What do I use to thin? I'm restoring a 1941 Chris Craft Deluxe runabout. Just sanded down the < a href=&quot;http://transom...should&quot; target=&quot;_blank&quot;>transom...should< /a> I use 1579 or 573 stain? I'm not familiar with &quot;41: Chris Craft Runabout. I used 1579 (red Mahogany) on restoration of of mahogany consoles and seats in 1970 Boston Whaler. Applied 1579 after striping old finish, light sanding and bleaching. my experience with 1579 was favorable, restored surfaces to original tone and after varnishing was as good or better than original factory finish. Filler stain left surface pores filled flush with surface. I have no experience with 573. I have learned that the older Chris Crafts used a darker brown stain, and the more recent Chris Crafts used a redder (looks orange to me) stain. I have a cutlas chris craft that have been stained before, Can I stained over it or I have to remove the old stain first? To do any stain job right you should sand down to bare wood before re-staining. One would presume that there was a sealer like varnish applied over the previously stained surface? If so, the stain won't penetrate through that. Sanding to bare wood will allow the new stain to penetrate the wood grain more fully. Putting new stain over the old will result in a darker color overall and a blotchy appearance in areas where the old stain is lighter or non existent. I am refurbishing a 1948 Chris Craft. I have stripped all the bright work to bare wood using a heat gun and scraper. I then removed all elements of previous staining material and miscellaneous varnish. To make the bare wood more consitant in color (especially new bungs) I applied a two part bleach followed by the new stain, wood filler and finally 8 to 10 coats of varnsh. In my opinion attempting to remove old stain on anything other than a very small area would be a very big job. In any event after all these years the is basically no chance of the bare wood being of a consistent shade anyway. The best way to use this product is to wipe in on with a rag let it set up for a while and then rub it off until you achieve a close matching shade. The darker you want the finish the longer you need to it to dry before and wipe it off gently, rub harder for a light shade. If you look at any vintage Chris Craft you will see color variations in the wood finish, that's part of the charm. An old friend of mine once told me &quot;if it looks great from the dock when it goes by, you got it right&quot;. I don't see a problem with that approach but, check the Interlux website regarding Interstain. How dark is dark? Walnut dark or?? The Interlux filler stain is fairly dark (Not quite walnut however) And it has the red in it. Look at pictures of post war Chris Crafts (Sportsman, Continental Etc) from the '50's and '60's ) that's the color you will get when put over mahogany. I'm not sure about Minwax products but, if you are putting oil based over oil based it should not be a problem. Baltic birch or Baltic beech? Either way, I would always do a sample. Stain on birch can be quite blotchy (beech less so). One can lessen that effect by first brushing on a 4:1 or 5:1 alcohol thinned shellac onto the raw wood. Then stain. For the gentleman's racer runabout I constructed, I used Chris Craft red. It is very red, as were those years of Chris Craft boats. It works fine with the sealer. Be sure to let the stain set for several days before attempting to apply the sealer, otherwise it may lift or dilute into the sealer, interacting with the sealer solvents. Also, thin the sealer to drive it into the wood bit more. I would suggest you test different stains and stain blends on small offcuts. There is really no way to tell for sure otherwise, and you may need to mix different stains to achieve the result you want. This product is a paste stain for staining the mahogany wood and filling its pores. Baltic birch is relatively nonporous compared to mahogany, the two woods will always look somewhat different regardless of color. I tried to use a Minwax red mahogany oil based stain on Baltic beech plywood and got a very dark maroon result. Would the interlux brown mahogany stain on Baltic Beech plywood give me a color that is closer to unstained varnished mahogany?Jim V.
In my opinion, on a boat, there is no substitute for the &quot;real&quot; wood. Due to the way it is made, plywood is the most difficult product to match colors with stains. There are many different species of mahogany, from around the world. In fact, I think the term mahogany is almost generic. I use this stain on a Classic Chris Craft which has had pieces replaced over the years, some by folks that knew what they were doing and some that did not. Unstained varnished mahogany varies in color from a light brown to a darker brown, depending on its country of origin and the age of the tree. Therefore, applying a stain, which has a consistent shade, becomes a challenge. The Chris has some original factory stain left, which I have preserved, over the years it has changed tones, now that is a light tone of reddish brown. That's what I try to match. The way I do that is by applying light coats of this stain, with a rag, letting it set up for 10 to 15 minutes, depending on the temperature, then rubbing it off. Most time it takes several applications and rubbings to get it to match the surrounding wood color, it's all by eye. It takes work but when it's done it looks great. I am not familiar with this type of plywood however, I would recomend this stain for your desired results. This stain comes as a paste, not a liquid so by using a thinner you can mix the product to your desired color and consistency. For best results, I recomend applying with a fine steel wool, light coats, staying with the grain, until desired results are achieved. By using this method, you are filling in any surface imperfections while enhancing the grain pattern in the wood as well as buffing the surface at the same time. Hope this was helpful and good luck. J.T. You will probably get the same result. Yes, I think it would. The thing is the Interlux filler stain has pigment like paint in it, so it only gets so dark and no more, unlike minwax which is more like ink than paint. Jim, I am not sure. However, google Don Dannenburg's website. He wrote two books on old boat restoration and he has a whole chapter on varnishing and stain. His Forum is free and there is alot of godd info available. Best of luck. Sparty On!! This product worked perfectly on my mahogany brightwork. The small can will cover a surprisingly large area when thinned with the recommended thinner. The stain is brushed on and then wiped off with a rag (you'll need lots of rags). The color produced is very consistent without any streaking or blotchiness. Fool proof IMO. I used a variety of mahogany stock on my boat, and this product made it look like it all came from the same tree. Used on my 1962 Grady White. Used in several applications to get desired color. I stripped the hatches and other trim components on my 1953 Hinckley. Thought about using a common household product until I noticed it wasn't for external use. Did a little research and purchased this product based on recommendations. It sealed nicely in one coat, and left a really smooth and nicely colored surface to start the varnish build-up which has gone very well. Great filler & stain rolled into one! A little goes a long way! Follow the directions on the can! You can thin this product down to meet your needs. If you want more filling qualities, use less thinner. If you want more of a stain, use more thinner. I used the "Brown Mahogany" stain on bare teak. When you first apply it, it looks like a warm red but by the time you work it into the grain and wipe off the excess, the color tones down a bit. When it's dry, you can even out any imperfections with Interlux Brush Thinner 333 and a piece of cheesecloth. I finished off the project with "Interlux Satin Varnish" and it toned down the color even more, bringing out more of the warm amber of the teak, creating a very close match to the surrounding wood on our boat. "Interstain" is very forgiving to use and has excellent filling qualities for small imperfections in the wood.